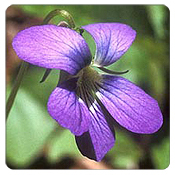 A small, rhizomatous Violet with 1 inch broad flowers that are unusually lavender. Native to the eastern US, they grow in rocky, open woodlands and on clay roadsides throughout the mountains. April-May.